Chicago brass band and performance art group Environmental Encroachment (EE) uses a mobile band, costumes, and antics to create unique entertainment environments. EE's mission is to create playgrounds for the body and mind through dance, music and art. EE's marching band is part of a new genre of music; a "HONK Band". HONK! Festivals include 'street-style' bands from around the world that are acoustic, mobile, mostly brass and drum instrumentation, and may have 'second line' entourages. EE's music fuses a horn section with marching and melodic percussion. Rhythms include 'world' beats and non-traditional American drumline. EE writes adn performs many original songs, and songs from other HONK bands. Environmental Encroachment also wears costumes, and often works with multi-media performance and artistic collaborators. Performances include stage shows, parades, weddings, funerals, historical re-enactments, children's shows, holiday theme parties, street busking, second-line processions, festivals, performance workshops, rituals, block parties, media and press conferences, circus sideshows, music for burlesque, birthdays, unvellings, coronations, proms, vaudevillian skits, and synchronized swimming with sousaphones. Environmental Encroachment's first official 'show' was on New Year's Eve Day, December 31st, 1994, with playground installations and live music interactions below Chicago's 18th Street bridge. 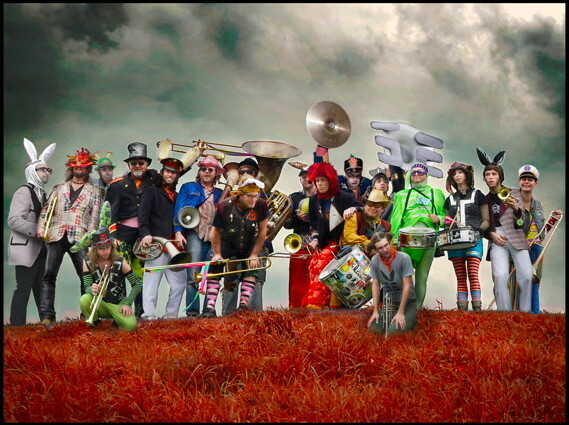 EE now includes alumni and band 'nodes' from around the world, and have a semi-organized network to form 'super transformational bands', able to travel, with a shared musical repetoire, with the time to tour. Tours include performances, workshops, lectures, childrens' shows, and fun events. Many people have contributed to this project special cyber thanks to Dan Merlo, Bret Lortie, SuperBucky, David Marine, Fred Hickler, Mister Petey and Kate Reigle - van West. Photo credits belong to Alyce Henson, Brilliantly Mad, Dan Merlo, M. Smith, B. Lortie, Heather, Josi, dr. flypaper, MisterPetey, Saverio Truglia, Robin Barcus, Jason Delancey, Darwin Stephens, Joseph Storch, Glitter Guts, HW Worden, Karmic Photography, Michael Canavan, the Utah Highway patrol and Chris Yeager for The Book of HONK. Most of these folks have links for further info on the EE links page. EE founding member David Christensen died of cancer poisoning in July of 1997. EE will always work with him in mind and spirit. His inspirations and spirit still shine. Peter Kadyk (Peter Overton) went to another world on April 17, 2001. He was another great contributor to the spirit of this project. He remains an inspiration to all that know and know of him. He raised the bars! I will "soon" have a page devoted to Peter's involvement in EE as well.